Belarus is one of 15 former Soviet republics. There is a developing economy and beautiful scenery. Here you will find some of the most wild and untouched corners of the continent, dense forests, numerous lakes and amazing wildlife. Over the future of Belarus however is still overhanging the fearsome shadow of the nuclear disaster in neighboring Ukraine. Summer is the best time to visit Belarus, especially during the months of July and August, when there are perfect weather conditions. The weather is pleasantly warm, and heats are rare. During this period of year is best to wear light summer clothes and shoes. It would be nice if you add into your luggage and a thin jacket as well, because it is sometimes possible to become quite cool especially in rainy days. If you have decided to travel to Belarus during the winter period you should know that local winters are very raw and warm clothes are especially needed. What to See While in Belarus? In the territory of Belarus there are numerous of national parks and other protected areas that are worth visiting. In the southern part of the country is Pripet National Park. It was founded in 1996 and covers one of the most picturesque parts of the country. It represents a mosaic of lakes, swamps and rivers surrounded by dense, moist-loving and lush vegetation. At the opposite northern end of the country is located Narachinski National Park. It falls within the borders of three provinces and is the largest in Belarus. Here amidst lush emerald green vegetation you will find numerous small lakes, whose mirror-like waters reflect fluffy cloud in the sky. In the northern parts of Belarus is one of the most popular destinations in the country – “Braslavsky lakes” National Park. There are over 50 lakes famous for their beauty. You can see traces of beaver‘s teeth over the tree’s bark along the lake and river banks. This is the largest rodent in Europe. You’ll be surprised how much can alter the environment one so small wild creature. “Braslavsky lakes” is a refuge and food source also for a large number of waterfowl that nest in the area. If you want to see European bison in its natural environment in Europe, then you should visit the National Park “Belovezhskaya Pushcha”. The place is located on the border between Belarus and Poland. Local nature actually resembles the northern U.S. and southern Canada. Although the country has many places that are really worth seeing, we would like to mention the „Berezinski“ Biosphere Reserve. It is under the auspices of UNESCO because of its amazing nature and biodiversity. Beautiful scenery and numerous protected areas make the country an attractive place to practice eco-tourism during the warm summer months. Flat terrain, safety, relatively good infrastructure and numerous picturesque villages make the country side of Belarus interesting place to explore by bicycle. Belarus is a typical European country that offers an exciting trip in the past. Its cities have interesting buildings, impressive churches and cathedrals, numerous museums and galleries, medieval castles. The most saturated with landmarks is the capital Minsk. The cultural life of Belarus is focused in this city. Despite the long time elapsed after the collapse of socialism, Minsk still has a slight Soviet flavour. Because of this reason Western tourists are often quite curious about the atmosphere of the Belarusian capital. Some of the major city sights are “Nezavisomost” square, the National Museum of Culture and History, the Museum of the Great Patriotic War (this is the name of the Second World War in the former USSR) and many other landmarks. No less interesting tourist places there are also in the province. Leaving the capital Minsk, one of the first places you should visit is the “Mirski” castle, better known simply as “Mir”. Its construction began in the late 15th century. Today, this fort stands on the outskirts of the town of Mir, about an hour southwest of the capital Minsk. The ruins of the “Krevo” castle are also one of the biggest attractions of this country. Although there are now only remnants of the former castle, it is considered the oldest in Belarus. The cuisine of Belarus strongly reminds the Russian cuisine. Perhaps the significant consumption of meat will be one of the first things that will make you an impression, visiting this country. The Belarusians consume much more meat than most European nations, especially in comparison with the Mediterranean countries. The climate of Belarus is raw and cold, and this increases the natural hunger of people to a fatty meal. Tourists often describe local delicacies as delicious, but quite heavy. Locals consume mainly pork, although beef and chicken also regularly attend in the traditional Belarusian cuisine. The meat is most often flavored with garlic and other strong spices and served with vegetables. Popular here are local smoked meat delicacies that are served mostly on special occasions. Most popular here are the cold-loving vegetables. Most consumed are potatoes, cabbage, carrots, turnips and beets. Cabbage takes pride of place in Belarusian cuisine. It is the main product to prepare different dishes, soups and salads. The most popular soups are borscht and cabbage soup. Mushrooms also present quite often on the table. Bakery in Belarus is most often made from rye, because this culture is well adapted to thrive in cooler climates. It is also the main ingredient of the traditional Belarusian drink – vodka. The Belarusians similar to many other European nations are masters of sweets. They prepare pancakes and excellent cakes, which are most often flavored with delicious jam of berries. Belarus has a temperate continental climate with warm summers and very cold winters. Summer temperatures are usually around 23°C, although are known many cases where the thermometers climbed above 30°C. Winters in Belarus are very harsh. The average daily temperature in January is usually below (-5) °C. However, Belarus remembers extremely harsh winters. On January 17, 1940 the former Soviet republic was frozen by Arctic cold. Thus, temperatures fell to record (-39) °C! Precipitations in the country are relatively scarce in the winter months and moderate during the warmer summer months of the year. February is the driest month in the year, and July is the rainiest. Belarus falls entirely amidst the East European Plane. Together with the West Siberian Plain, the Great Plains of North American and the Amazon Plain, it is considered one of the most extensive lowland areas on the planet. It is situated between the Black Sea and Arctic Ocean and between the Carpathians and the Urals. Therefore, Belarus has completely flat terrain. The Dzyarzhynskaya Hara (Dzyarzhynskaya forest) is the highest point in the country. The place rises only 346 meters above sea level. The territory of Belarus is crossed by several large rivers – the Dnieper River, the Western Dvina River and the Pripet River, which flows south and passes near Chernobyl in Ukraine. Belarus is very rich in water. The country has a huge number of small lakes. Their number is largest in Southern Belarus, where are located the Pripet wetlands. Much of the territory is covered by mixed coniferous and deciduous forests, which are considered among the best preserved on the continent. Wildlife of Belarus has preserved an impressive diversity of wildlife. In local forests can be seen foxes, lynxes, bears, wolves, various species of small carnivores, a huge variety of rodents, deer, badgers and many others interesting animal species. One of the most striking representatives of the fauna in Belarus is the Eastern European bison. It is also known as aurochs. Although smaller than its American relative, the Eastern European bison is no less impressive and spectacular view. Today this specie is almost extinct in Europe. There are very few animals survived in certain Eastern European countries. One of them is Belarus, where these large herbivores inhabit only some protected areas. Belarus is located in north-eastern Europe. Occupies an area of 207,595 sq.km. It borders with Russia, Ukraine and the EU (Poland, Lithuania and Latvia). Belarus is a landlocked country. The capital Minsk is situated about 450 kilometers from the shores of the cold Baltic Sea. Belarus is a developing country that is among the poorest in Eastern Europe. Like many other countries in this part of the world, it still bears deep scars from the long communist regime. The largest impact on the economy of Belarus, however, was inflicted by the horrific nuclear disaster in Chernobyl, Ukraine in 1986. Since the accident occurred pretty close to the border, Belarus was even more affected than Ukraine. Vast areas of fertile farmland were infected by radiation and remained unusable forever. The country receives multiple benefits from different countries, but will probably take decades while recovering from the catastrophic consequences. Belarus has always been predominantly industrial country. Major sectors of the local economy have always been the production of machinery, chemicals and fuels. After the nuclear accident, however, the importance of the industry increased. Unlike many other countries of the former Soviet Union, which since the collapse of USSR to a large extent re-oriented their external trade relations toward the western countries, including the European Union, Belarus maintains closer ties with the Russian Federation. Belarus, Russia and Kazakhstan together created the Eurasian Economic Union, which aims to achieve economic integration similar to that in the European Union. They consider creating an equivalent to the Schengen Agreement which will enables free movement of people and labor within the Eurasian Union. Belarus is often reproached by the Western countries that restrict and violate the freedom of speech, which is a basic human right. The country became very famous after the beginning of 2012 by the imposing of restrictions over the use of foreign websites. In the years following the collapse of the Soviet Union local currency went through hard times including hyper-inflation, which was brought under control applying very stringent measures. The population of Belarus is about 9.5 million inhabitants. It is relatively ethnically homogeneous. Approximately 8 of every 10 residents are Belarusians. The communities living in the country are mainly from neighboring of Belarus countries, especially from Russia and Ukraine. Belarusians similar to most Eastern Europeans profess the Eastern Orthodox faith. It belongs to the Eastern Slavic languages and therefore has a number of phonetic and grammatical similarities with the Russian language, which is second in importance and popularity in the country. Given that most of the territory of Belarus provides favorable living conditions, the population is relatively evenly distributed over the territory. 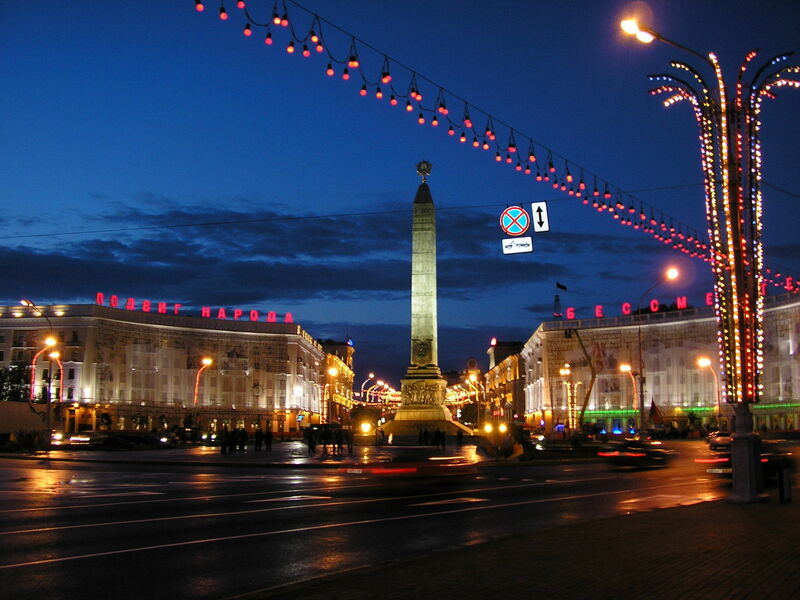 Minsk, the capital of Belarus, is the biggest and most populated city. It is home to approximately 1,720,000 people. Other cities whose population is around or more than 300 000 inhabitants are Gomel also known as Homyel (in south-eastern Belarus), Mahilyow also known as Mogilev (in the eastern parts of the country), Vitebsk (in the North of Belarus), Hrodna or Grodno (in the western parts close to the Polish border) and Brest (in south-western Belarus, also near the border with Poland). Belarus has an impressive past, but a brief history of an independent country. The territory of the modern state has always been within the borders of neighboring countries. For long periods of time, these lands were ruled by the Russian Empire, Poland and Lithuanian Principality and all of them have left their cultural imprint. In 1918 was founded the Belarusian People’s Republic, but only a few years later, in 1922 Belarus became a part of the Soviet Union for almost 7 decades! More than 30% of the population of Belarus died during World War II.